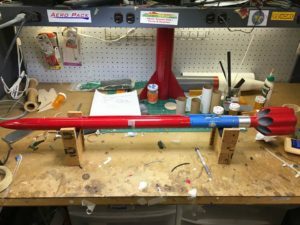 In the #rocketober tradition, here are pictures from my rocket shop. The parachute faring portion of XR10x / Endeavour, has taken a beating over the service of the rocket. 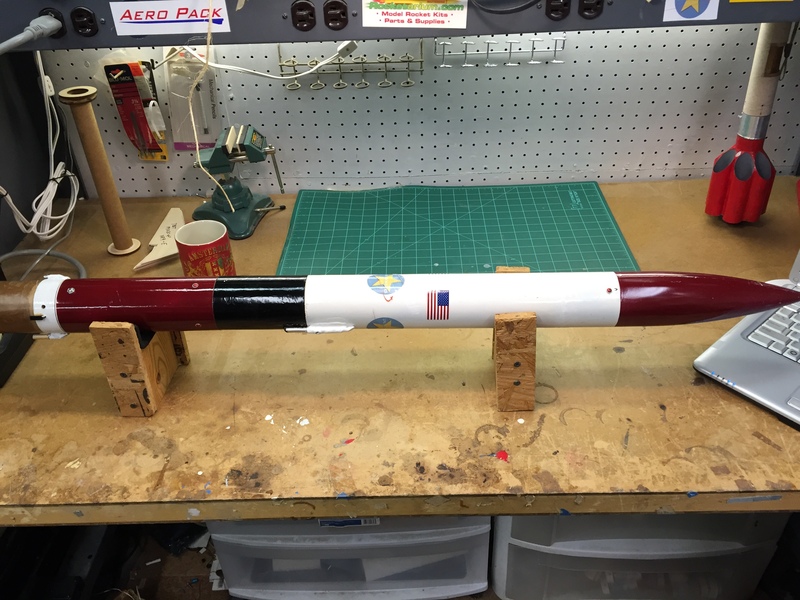 After the low and slow mishap last year, the section suffered a bit of a kink along the tube spiral, but I figured it’ll be fine for a few more flights, and was going to replace it before the planned G-64 launch. 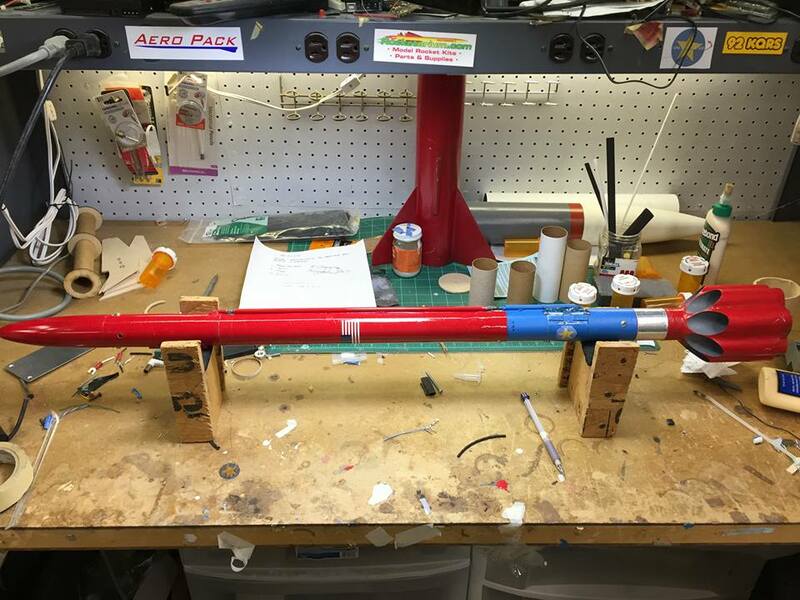 Well, last week’s accidental G-64 launch put enough dynamic pressure on the rocket to pretty much break the kink to the point where the only thing that kept the section from coming apart was the electrical conduit running through it! I built up a new section over the past few evenings, and got it in place. First pic is the unpainted section. The old part is right below it. 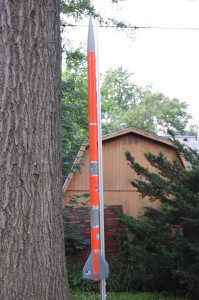 You can see the over-stressed kink running perpendicular to the silver conduit…it is the white line seen through the red paint to the right of the flag. 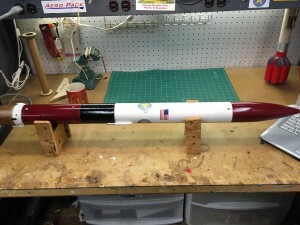 Normally the period between Christmas and New Years day is filled with rocketry activity. Not this year! El Niño has made the weather downright disagreeable for rocketry. It has been either raining, or just too windy — or both. So what to do? Maintenance! Starting with the clean up & close inspection of Nesaru before her next flight. This was supposed to happen after her highest power flight to date, but that has been scrubbed due to the weather. So the maintenance routine was bumped ahead so I’d have something rocketry related to do ;-). In her three years of flights, she has taken a lot of bangs and dings. My work was mostly cosmetic. Patching up the worst of the dings and scrapes. Along the way I am doing close inspection of the harness points, electrical, and internal support structures. Nesaru Parachute Fairing, payload & Avionics section. All was fine on the upper section / parachute fairing. 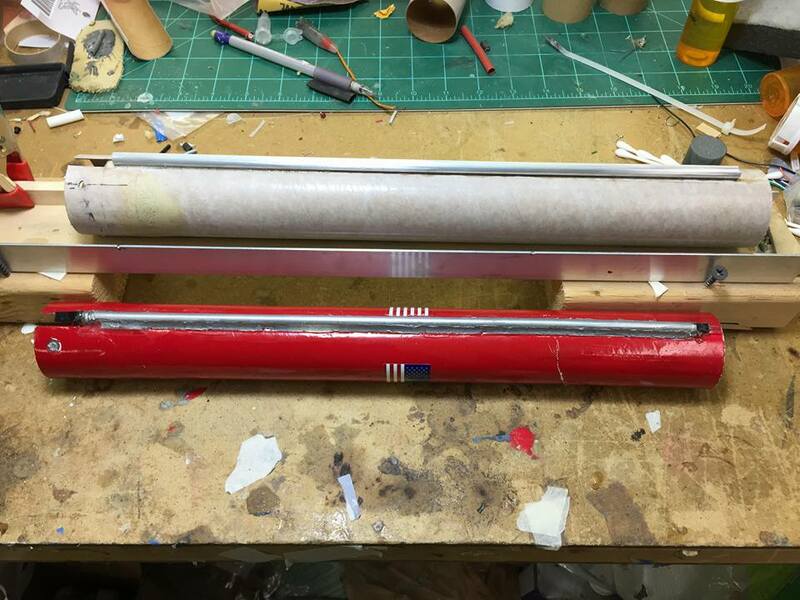 Tomorrow I will inspect the avionics and start the inspection on the booster section / Fin can. 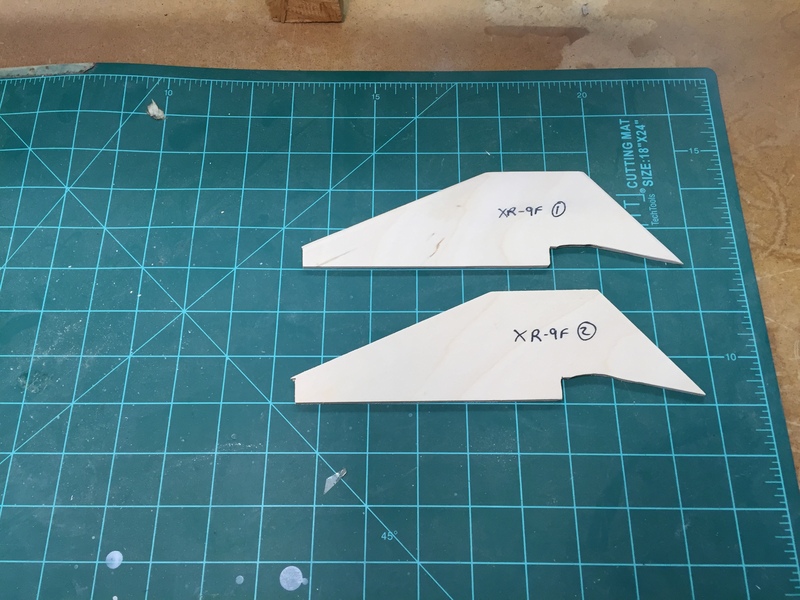 Earlier today, I started on a design modification to convert Comanche from a model XR-9C design to an XR-9F. Over the past several months, I’ve been occasionally running computer simulations on proposed design modifications to the XR9 series rocket to better optimize it for flights across a broader range of wind conditions. Currently, launches with XR-9C have to be scrubbed if sustained winds of 12 MPH or greater is experienced. The Nesaru (Perseus XR6) design, on the other hand, has been optimized to fly in winds exceeding the limits of the safety codes. My desire is to give the XR9 rocket the capability to fly in a similar range. The design modification involves a change to the fin shape. These fins will be part of a new booster section to bolt to the Comanche XR9 stack, converting it to the new XR-9F design. 2 of the new fins for the XR-9F design modification. The new fins have been cut out, and I am starting to sand them & airfoil them. A new motor retainer and transition piece will be ordered next week. One of the main goals behind my modular rocket designs is to be able to make design changes by replacing pertinent sections of the rocket. This will mark the first time I have done this. Up til now, the modular design has been most useful in repairing damaged sections of the rockets from either launch / landing mishaps or from wear and tear. I am hoping to have most of the new booster work done by sometime in February. Comanche XR9 Launch vehicle modifications. 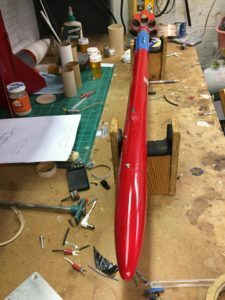 The Comanche XR9C rocket is born from Project Artemis – The series of four fin based rockets that were used in the bulk of my early experiments in rocketry. 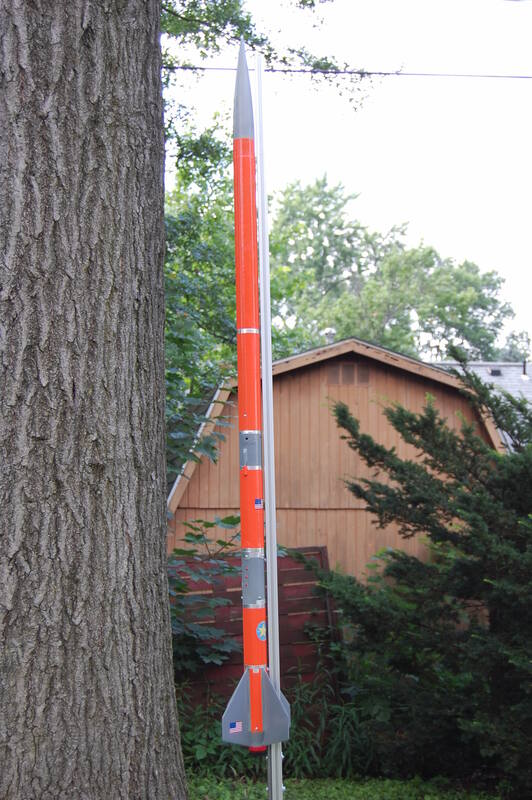 This was the first big experimental project that marked my re-entry to the rocketry hobby in 2009. Side note: The fleet of experimental rocketry designs all bare the “XR” design designation. 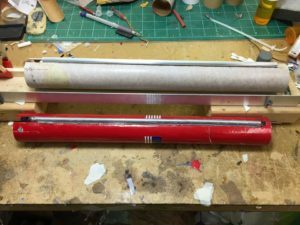 These experimental rockets are designed to push the envelope in some aspect of hobby rocketry design. The knowledge gained is used in developing advanced features in “standard” rocketry that are intended for routine hobby rocket flights. Comanche’s four fin design (while being a different physical shape than Artemis has the same effective fin area. One benefit of this was that the Artemis flight data (which was well known at this point) could be compared and applied to project Comanche. Comanche XR9C proved that performance was indeed very similar to the Artemis series of rockets. Right down to some of the flight restrictions – namely the 12 MPH wind speed limitation. The wind speed limitation became quite the issue…with many flights being scrubbed. By comparison, One of Project Perseus’ design criteria were being able to fly in a broader range of wind conditions. 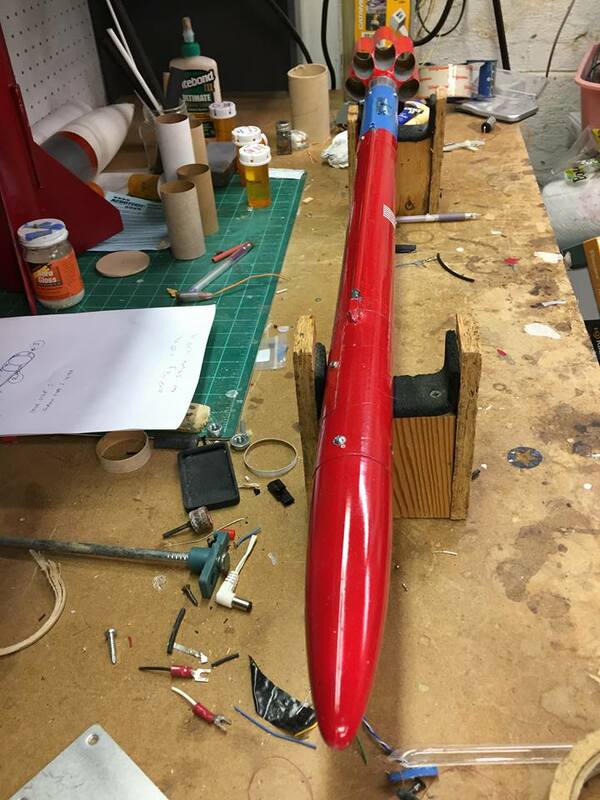 The Smaller Perseus rockets (Perseus 1 / XR4) were able to fly in wind conditions well over the 20 MPH limit of the rocketry hobby without issue (besides recovery issues). This ability carried forward into the XR6 (Perseus V) design. Much of this flexibility seen in the XR4 and XR6 designs is due to the computer aided design of the fins. The same process was begun for the XR9 design. After several months of testing & modeling in the computer design domain, an updated design designated XR9F is about to be unveiled. The fin shape of the XR9F is very similar to the XR9C, but “stick out” much less. Tests are showing that this change allows the XR9F stack to withstand a much broader range of winds than currently experienced. There are many tests left to do before the new fin design is unveiled…including some tests using entirely different fin shapes in an attempt to attain better stability at flight speeds in the 200 MPH range. The testing is expected to continue through early 2016.